You can use this site to practise typing hiragana, katakana and kanji. There is also some sentence-level practice and dictation practice. As the practice continues in stages, you can feel a certain level of achievement as you progress. You can practise entering hiragana, katakana and kanji. There is also dictation practice. You can use the site to review kana and kanji. You can also practise entering whole sentences of Japanese. There are 6 different steps. Please advance through these steps in order, from the start. 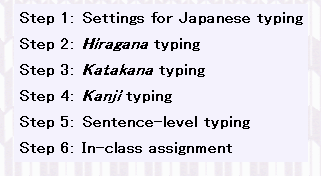 A 'kana chart', to help you with your typing, is always displayed on-screen. If you want to see the answer, just press the 'answer' button. The sentence to be entered will appear in a separate small window. If you don't understand exactly how you should input the Japanese, you can check when you are in the middle of your practice, instead of waiting until the end. It's a good way to save time! 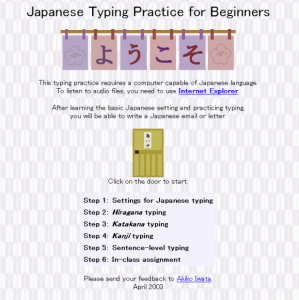 If you are interested in practising typing in Japanese, please read our "e! Kore" article called Is typing in Japanese a weakness of yours?! Solve your problems here! (Beginner's version).